Observation - Thongweed button (Himanthalia elongata) - UK and Ireland. 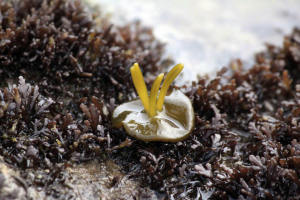 Description: Plant, I thought a seaweed, now identified as Thongweed (see identifications below) on Filey Brigg (a wave cut promontory on the North Yorkshire coast), November 2012. Plant, I thought a seaweed, now identified as Thongweed (see identifications below) on Filey Brigg (a wave cut promontory on the North Yorkshire coast), November 2012.